Eevee grew to level 32! This has been a surreal and difficult year, but everything turned out much better in the end. Eevee grew to level 29! Like a week and a half ago. Eevee grew to level 28! I’m a bit late; my birthday was on the 12th. Oh, well. I don’t know what to say about 2014, really, so let’s just start typing and see what happens. Bought the house, finally divorced myself of the old one. Paid half of it off. I made some (one and a half?) ZDoom maps. I first got into the ZDoom community over a decade ago — I found articles on the ZDoom wiki with my own edits in them from that long ago — and only now have created a map that’s actually playable. By which I mean it has an exit. In the course of doing this, I also wrote a bunch of patches for SLADE, the editor I’m using and the only one that really exists for Linux. I released a couple more tiny modules on PyPI: cgettext, classtools. I actually got my dream roguelike, flax, to the point that it’s playable. I started trying to draw, on and off, again. I’ve recently gotten in the habit of doing a little daily comic, since my partner is doing the same. I learned Inform 7 and wrote some of a text adventure. I also made a whole lot of aborted attempts at writing fictional prose for my partner’s Flora universe; it turns out fiction is hard, maybe. I feel like I’ve grown a lot, but I can’t quite explain how. I tried a lot of things I haven’t really tried before, and they’re all informing how I think about things now. I don’t feel like I have a lot to show for all of them, though. Hm. For once, I’m also considering what I would like to do this coming year. Write more. I only wrote six posts last year! I blame this mostly on my emphasizing this as a “real” blog — I’m now unsatisfied with posting anything that isn’t as long and informative as, let’s face it, the PHP post. I need to knock that off. Back in my LiveJournal days, I once wrote a post every day for a month; perhaps another such month is in order. Do a bit more with this domain. Ever since I bought it, I half-intended to also host separate pages for things I’ve made, and I don’t mean just cramming them onto a single “projects” page. I don’t know what form this will take yet, but as long as the domain is actually my name, I’d like for it to be something that more accurately reflects me. Write a book. Or at least a significant chunk of one. I have a lot of ideas for a programming book (series?). Make money. I have a salary from a “real” job, of course, but I would really like to prove that I could someday support myself with my own endeavors. Any of the above are possible candidates. Only five things in a year. How hard can it be? Another year gone by. I don’t think I even did one of these last year, but let me think about what I did while I was 26. I lost a cat for the first time. It had… quite an impact. Later I adopted a new little buddy, Anise. I bought a Soekris router and slapped pfSense on it. No, really, you would not believe what a nightmare this was to actually make work. I did a whole bunch of Yelp-funded work on pyScss, turning it into a rather solid Sass compiler. I learned a good bit about parsing from this, which is cool since I’ve always thought it interesting but never found a good opportunity for getting my feet wet. We (myself, my boyfriend, my girlfriend, and her husband) just moved to Vegas, which has been fantastic. The old house was co-owned by someone I’d gone to room with after moving out initially, and with the addition of my cluster (and accomanying menagerie) it had gotten a bit crowded. We finally got around to buying a new house in December, and it’s been pretty great so far; the house is cheap but huge (with a pool! ), food is everywhere and also cheap, and the weather is rather a bit less dreary than Seattle. I did a whole lot of technical tinkering and not a whole lot of releasing software and that is a shame. I’d really like to actually spit out some useful things this year. Fingers crossed. Surely I’m forgetting something; that doesn’t sound like a lot. Okay yeah obviously buying a house is kind of significant, but it only ate a month. And I guess Styx’s declining health ate another month, during which I was largely a zombie. And pyScss was the only significant project I worked on for quite a while… hmm. Seems like 2013 was a dreary void of a year for a lot of people. Even a millenium can’t escape being awkward and useless when it’s 13. I can hardly believe I posted a bunch of photos of Styx earlier this year. Three months later to the day, I put him to sleep. I suppose this is his obituary. In early December 2011, I bought a digital SLR. In mid December 2011, I bought a cat. Styx is a Sphynx, one of the hairless breeds. (Wow! Just like Dr. Evil’s cat! I have never heard that before! You are so clever!) Mel already had a sphynx, Twigs, and he pretty much sold me on Sphynxes being the best cats ever. Though I think Styx might have more of a Devon Rex personality and body shape, based on Mel’s cat breed book. I’ve accumulated a mountain of cat photos, but only a few of them have seen the light of day. Let’s fix that! And please do pardon my shoddy attempts at composition and framing and white-balance and post-processing and otherwise trying to take photography more seriously than Instagram. Having a bit of trouble finding a place to keep a three-foot-tall plush, though. He’s got a hook near the top of his flame, but hanging him from the ceiling doesn’t really help since he hangs down to chest level. I’m not too proud to admit that I might have a problem: where can I possibly fit more shelves? So someone hit my car last week. It was parked on the curb, right in front of my house. (We have four cars and a packed garage, so.) I heard a super loud smack, but thought someone had dropped a large appliance on the sidewalk until Mel appeared in my doorway with someone hit your car. I felt kinda bad for her, but at the same time, that this even happened is terrifying. I don’t know if a human being would have survived the same impact. She said she’s “normally such a safe driver”—I guess she’s only a dangerous driver sometimes, then, and it turns out those are the times when you hit things. Called 911; couple police cars came to direct traffic around her and file an accident report, and a flatbed tow truck took her car off. I had to leave my car “parked” in front of a fire hydrant overnight, because the rear axle was bent so much that it doesn’t move at all. My car was towed to a local shop the day after; they called me back earlier this week with an estimate around $7400. The driver’s insurance is paying for absolutely everything without question, though, so I shouldn’t be out a dime over this. I have a rental in the meantime. This is actually the second time this has happened; early this year I was street-parked on the other side of the street, and I awoke to find a conspicuous dent in the driver’s side door. And when I say “dent”, I mean it spanned the bottom of the door up to the window; looked like a shopping cart had hit it at an angle while going 40. I’d only slept for a few hours the night before, and Mel had been awake through the night, but neither of us heard or saw anything. Don’t know what happened or who did it. I thought it would be a simple fix, but the shop had to replace the entire door, I had to pay a few hundred deductible, and my insurance went up. Super. I’ve never hit anything, never gotten a ticket, never even been pulled over. I live in a fairly sleepy town, not on a major road. And in two years my car has been hit twice, while parked at home. I’m just gonna start parking on the lawn. 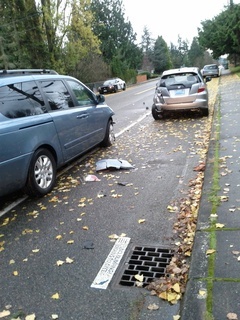 Below are some photos of my poor darling car. Consider this a test of this fancybox plugin gallery plugin. This is a thing I got yesterday. Not 24 hours ago, even. Mel had it done last December and started dropping hints that I should also get it done pretty much that day. I stalled and dawdled forever, but I’ve been experiencing a lot of eye strain lately and was due for an eye exam anyway, so I finally made an appointment for Wednesday. Not that Mel was continually bugging me to do it or anything, but when faced with the prospect of doing something terrifying, spinning it to myself as something someone else wants doing is a convenient brain hack. Yes, terrifying. You see, I don’t like things i my eyes. I don’t like water in my eyes. I had never opened my eyes underwater until a couple months ago, and it still feels like a superpower to me. If I get an eyelash in my eye, I have to find a mirror and manually guide it out because it bugs me so much. And now I was facing a medical procedure that involved shining a laser into my eyes. A laser! You know where you’re supposed to shine a laser? Anywhere except into your eyes. Everyone at the clinic told me reassuring things, like that it’s a cold laser, or it doesn’t hurt, or it’s over pretty fast, or whatever. No, no, you don’t understand. It’s not that I don’t like things in my eyes because some rational underlying fear. I just don’t like things in my eyes, the same way I don’t like sharp things under my fingernails, or I don’t like spiders. I don’t like it. It’s creepy and I want to run away from whatever it causing it. Okay, this story seems to have gotten a little off-track. Let’s rewind. Eevee grew to level 25! Ho jeez what have I even done this year. Lately I’ve been drowning in an (even worse) inability to do things. Something dislodged all the cool progress I made at the end of last year and I don’t feel like I’m getting much of anything done. Numerous conversations with mel, strangely-relevant blog posts I stumbled upon purely by accident, and brilliant self-reflection are starting to help. I am now, officially, as literate as a native Japanese two-year-old. Almost. Maybe. I actually meant to condense all the grammar I know down to bullet points that make sense to me, and post it before I took the test. I kinda never did that. Oops! Maybe some other time. I haven’t really studied in the past two months, either; time to get back into that. I picked up a surprising number of phrases from watching FMA, so that’s a good sign.